While sometimes you can’t really control lag and spiking, making sure you get a top notch router will make sure that the lag isn’t because you got something cheap. It might just very well save you from smash your nice gaming keyboard. Obviously, a wired connection to your gaming machine is going to be the best way to get great results, but sometimes your room layout or housing situation requires you to go wireless. This one took us a while, but after spending dozens of hours looking at options and making sure we recommend optimal settings, the best router for gaming is the NETGEAR Nighthawk X4S AC2600. Our pick – The best router for gaming is the NETGEAR Nighthawk X4S for its speed, range and feature set for the price. The Netgear X4s is our default recommendation for gamers looking to ugprade their wireless experience. It’s one of the fastest routers out with great range and features at a price that won’t break the bank. It’s pretty much ideal for any gamer outside of large households with a dozen plus concurrent wireless devices going at the same time. The X4S is a speed demon, what this means is file transfers, media streaming and game streaming are all going to come through in full fidelity, as long as your internet connection can handle it. The dual core 1.7 GHz Qualcomm processor and 512 MB RAM are really put to good use in the X4s. IGN, Tweaktown and CNET are all saying the same thing, the X4S has great range, with CNET claiming that the connection comes through after 3 walls and 200 feet. With both 5GHz and 2.4 Ghz, MU-MIMO and 160 Mhz support, the X4S will stay ready to serve future wireless devices for a good long while. By combining two standard 80 MHz frequency channels on the 5 GHz band, routers that are capable of 160 MHz will be able to produce even faster throughput speeds, but right now, no devices use the 160 MHz frequency. The X4s can serve AC/N/G/AB type wireless so even old deviceours will have something to connect to, looking at you Nintendo 3DS. The X4S will actually get better over time as more devices properly use MU-MIMO, meaning the X4S will not have to switch single stream routing as often, what this means is you’ll get better concurrent throughput and responsiveness. The X4S features something called Smart Connect, which is essentially band steering, allowing for high priority devices to get priority access to the faster 5 GHz while farther or low bandwidth devices connecting to the 2.4 GHz band for more connection reliability. The X4S also packs quality of service (QoS), which is a standard on all routers now, to give distinct priority to types of traffic or devices. For example, if you want to make sure game traffic gets priority for router over HTTP web browsing traffic, QoS is where you can set that up. 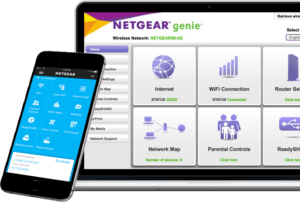 Netgear takes it a step further by introducing Dynamic QoS, the router will detect the high usage devices and automagically give them priority over a web-browsing tablet for example. With 2 USB ports and an eSATA port, the X4S can serve an external hard drive as a NAS or network enable a USB printer. The X4S boasts the standard 1 Gigabit WAN, 4 Gigabit ethernet ports for wired connectivity. A lot of people dislike Netgear’s genie firmware, citing that it’s ugly and not intuitive to use. It’s still serviceable despite it not being as sleek as, say the Asus AC5300’s interface. The router is not exactly minimal looking, it’s not as gaudy and spidery as the Asus 5300 but it definitely would stand out in a living room. It’s not absolutely terrible and the X4S has a smart button on the back that allows you do disable the flashing LEDs if you don’t need to see those all the time. Smallnetbuilder gives the X4S its #1 spot in their Router Ranker. NETGEAR’s R7800 is Smallnetbuilder’s top performance-ranked choice. On Amazon, the X4S has a 4.5 star rating over 2000 plus reviews. 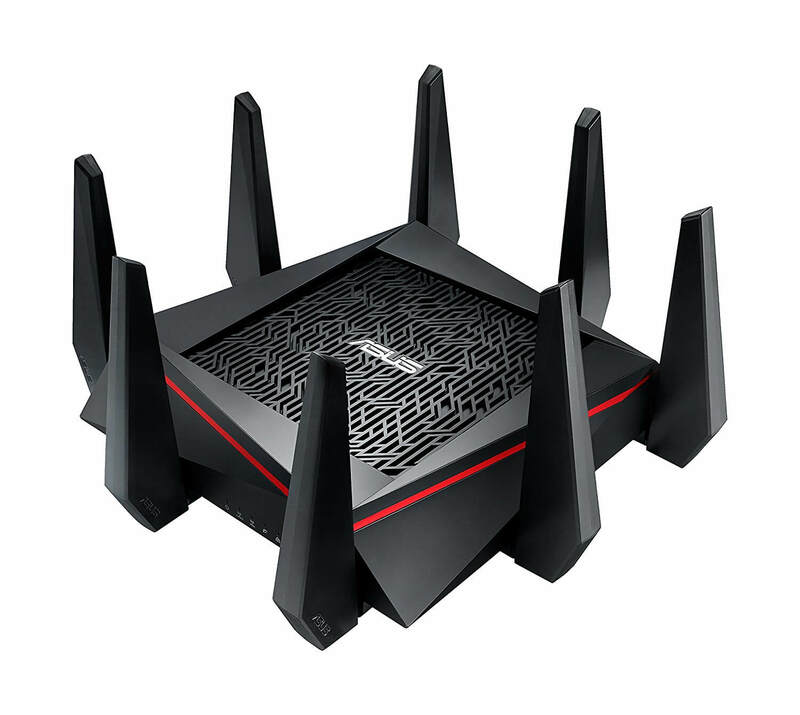 You should get this router if you live in a smaller place with not too many gamers playing at the same time. 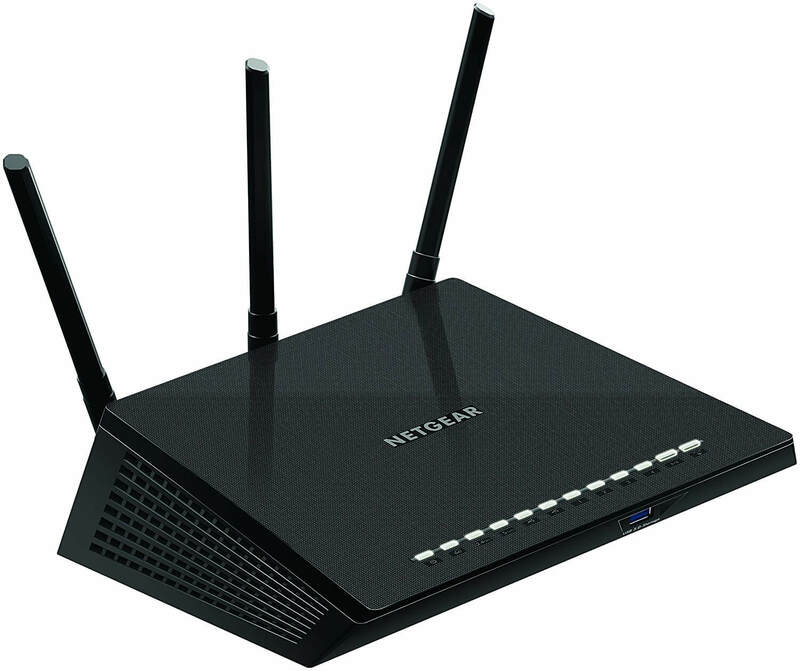 The Netgear Nighthawk AC1750 is still a dual-band router sporting good speeds over 5 Ghz and 2.4 Ghz bands. What it’s missing are MU-MIMO and generally a slower CPU and RAM meaning that adding a bunch of devices will bog the router down. 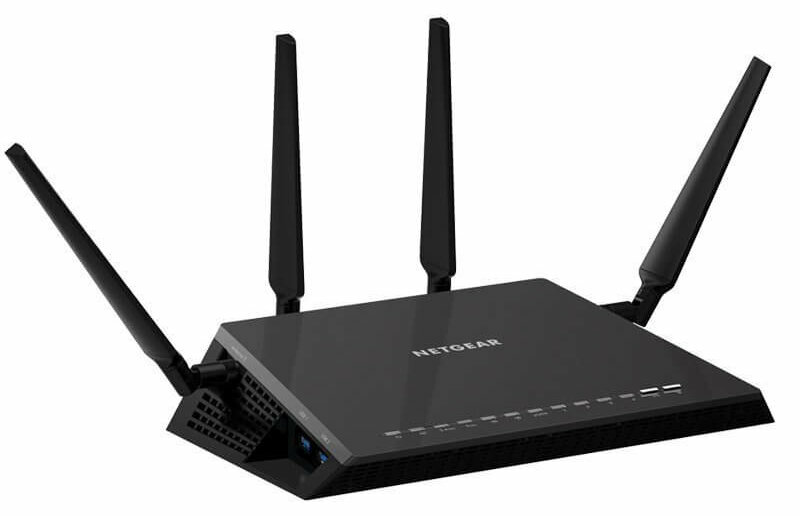 Budget pick – If you don’t have a ton of devices, the Netgear AC1750 will more than be able to serve your needs with great speed, features and range. Otherwise, the AC1750 is very capable and will serve your present needs very well. It features a Broadcam 1 GHz dual core processor with 256 MB of RAM. The AC1750 is rated for 1300 Mbps on 5 GHz and 450 Mbps on 2.4, these speeds more than enough for all current day applications, even at real world rates. It still packs beamforming, band steering and dynamic QoS. The AC1750 packs the same 1 WAN, 4 LAN 1 gigabit ports. It features 1 USB port instead of two. Ideally, if you’re a small household or don’t have very many concurrent devices under use, this is a good pick for you considering the AC1750 only costs around $100. The Asus AC5300 is a beast of a router, it’s a tri-band router, with one 2.4 GHz band and two 5 GHz bands. The 2.4 GHz band is rated at 1,000 Mbps and the 5 GHz bands are 2,167 Mbps each. Upgrade pick – If you have a lot of concurrent device usage then the Asus AC5300 is a better pick for you. The major difference between this router and the X4S is the ability to handle more devices due to its triple bands. The AC5300 packs all the nice to haves of a premium router: 4×4 MU-MIMO, beamforming, band steering, and adaptive QoS. It has the name number of ports as the X4S, 5 total gigabit ports, 2 USB ports. The AC5300 also features the ability to link two gigabit ports into one connection to create a 2 gigabit ethernet connection. The other advantage that the AC5300 carries is a much better out of the box firmware experience, it’s much more polished and game-ey compared to the X4S interface. 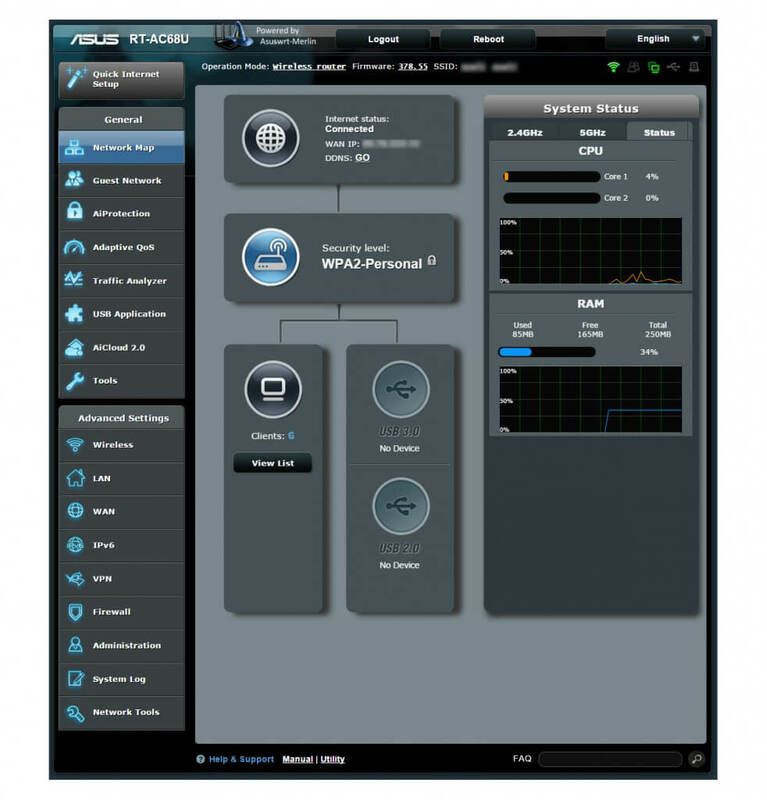 The AC5300 has built in WTFast GPN compatibility if you have that service. There are a few models that are even more powerful (and expensive) than this router, at this point in time, there’s no reason to take a look at those routers, they’re exceedingly expensive and most gamers will not get good use out of them. Do you really need to upgrade your router? The CPU and ram on these routers is very limited, bringing in 5+ devices onto an older router at the same time will likely cause the old router to choke. If your router is 2.4 Ghz only, 2.4Ghz is a very crowded, having multiple bands will allow you to get the cleanest signal possible at home.